Purpose: Bringing about positive change begins with people aligning themselves around a shared purpose. A purpose that is clearly articulated and powerful in its intent is essential for enabling collaboratives to get off the ground and sustaining momentum for continued progress. Purpose motivates people who have different interests and reasons for collaborating to continue working together. It also focuses people's attention and energy towards a collective outcome, like circulating more money in the local economy, which enables collaborative efforts to stay on track. We work alongside your group to co-create a purpose statement that is clearly defined, mutually understood, and collectively owned. To drive this shared purpose forward, we also support team members and collaborators in developing powerful, compelling goals that everyone is aligned around and committed to achieving. Engagement and Leadership: Achieving collective goals depends upon people who have the skills and attitudes to work together effectively and are supported by leaders in performing at their best. Knowing what results are being collectively worked towards, everyone's roles, and what is expected of each other frees up the group to focus on the challenges and opportunities that brought them together in the first place, like preserving affordable housing in neighborhoods that are rapidly gentrifying. Members who share responsibility for the team's performance can become better leaders who know when to take the initiative, offer support, or step back so others can step up. We support you in strengthening the composition of your team so that there are enough members with the skills, resources, and commitment to fulfill its purpose. We help you transition from managing a group of individuals to facilitating teamwork. For collaboratives we work with you to identify and recruit members who represent the diversity of the system to be changed, are able to work well with others, and are committed to the change goal. We also help put program and operating teams in place that have the skills, resources and commitment to lead with instead of for the collaborative. Advisors and Support: Successful teams and collaboratives not only pay attention to what needs to get done, but also how it gets done. The changes we want to make, whether it's raising more money, building a stronger nonprofit board, or dismantling institutional racism, are more likely to succeed and be sustained over time when they are supported. High-performing teams know how to leverage, align, and deploy resources to achieve collective goals. We work alongside teams to put a structure and processes in place that support teamwork as well as develop a culture that incentivizes team-oriented behaviors. For collaboratives we help stakeholders manage tensions, such as fostering unity while maintaining diversity, the need for certainty and creating the space for new ideas to emerge, providing structure and flexibility to complete tasks, and generating buy-in and quickly moving to action. Communication: Teamwork is not only about getting work done; it's also about knowing how to work well together. Building communities that are better places to live for everyone sometimes means going slow to go fast. Although it may seem expedient to dive straight into tasks, we can end up spending more time later on sorting out misunderstandings and unintentional delays if we haven't figured out an effective way to communicate with each other, which is especially critical for virtual teams. We model effective collaboration in our work through the quality of partnerships we develop with changemakers and by transferring the skills needed to build relationships that are grounded in trust, open communication, and accountability for shared results. 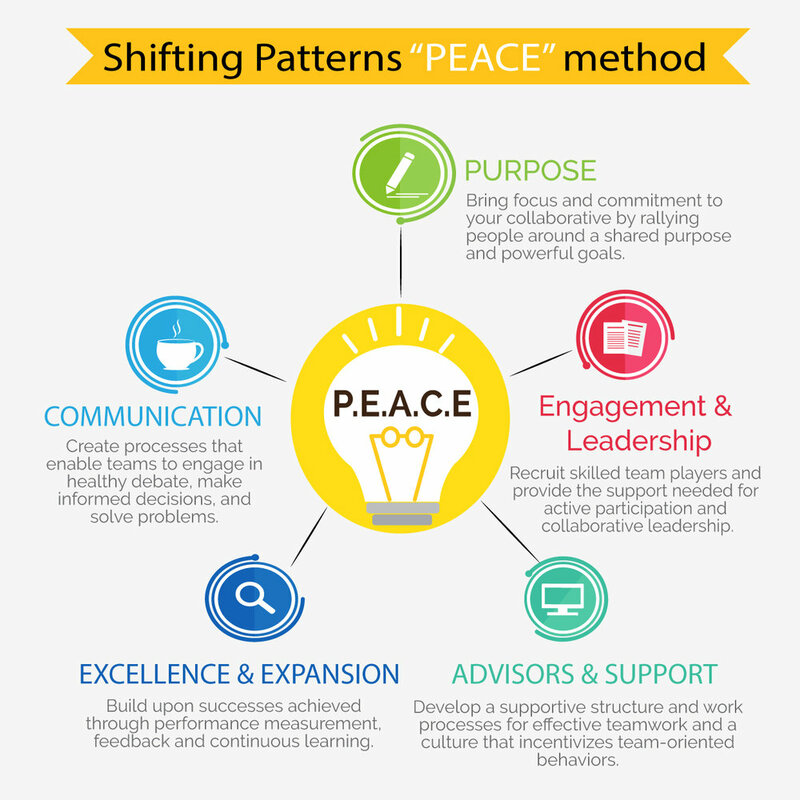 We also work alongside teams and collaboratives to put processes in place for decision making, problem solving, and managing conflict as well as designing effective meetings. Excellence and Expansion: High performing teams and effective collaboratives not only focus on the results they achieve through their work; they also pay attention to the quality of experiences that people have as a result of working together. Diverse teams and collaboratives are more likely to produce better results, particularly when the views of the people who are directly impacted by the work are included from the beginning. Including diverse perspectives and skill sets also allows for a more holistic assessment of results achieved, areas for improvement, and opportunities to build upon what is already working. We help team members and collaborators develop shared criteria for success, put effective processes in place for interpersonal and systemic feedback, measure results based on the quantity and quality of lives changed, and create an environment that supports learning and continuous improvement.